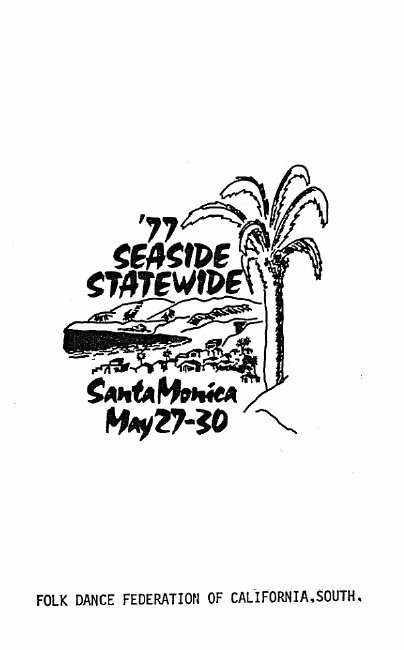 One can feel those cool sea breezes upon approaching the Miramar Hotel, headquarters for Santa Monica's 32nd Annual Statewide Festival, which they choose to call "77 Seaside Statewide." President Sheila Ruby, in her program message, not only welcomes us but spells out what we can expect. How about six live bands, 18 magnificent exhibitions, 2 Costume Parades, an Institute, After Parties, a Barbecue Picnic, and more. Things started with a Pre-Party Friday night in the Miramar. The Institute in the Auditorium Saturday featured Balkan, English, Finnish, Greek, and Polish dances. The Festival dancing took place Saturday night and Sunday afternoon and night in the Auditorium, with appropriate breaks for exhibitions. There were Costume Parades both Saturday night and Sunday afternoon. All After Parties were held in the Miramar Hotel from midnight until ???. The Sunday morning Installation Brunch took place in the Miramar with Dorothy Daw, Chairperson, and Dr. David Gold, MC. The principal business as usual was installation of new officers, and was conducted by President Raymond Olson of the North and Sheila Ruby of the South. Only Sheila received her Past President's pin as Raymond would serve another term. 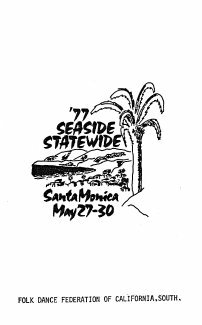 The Barbeque at Lincoln Park on Monday was the concluding activity of this fine "77 Seaside Statewide." There would be a bit of dancing on the slab afterwards. Our thanks to Sheila Ruby who assumed the robes of Statewide Chairperson, along with her presidential duties, as well as the Committee members who assisted. Here a few we think should be mentioned: Business Manager, Ralph Miller; Coordinators North and South, Vi Dexheimer, Paul Pritchard, and Evelyn Prewett; Costume Parade, Elsa Miller; Decorations, Bunny Hogan; Exhibitions, Eugene Ciejka; Institute, Sam Shatz; Masters of Ceremonies and Callers, Valerie Staigh; Property Management, Henry Ruby; Publicity, Pearl Bleadon; Taping and Sound, Ed Feldman; and many others. We thank you.